Discuss and show examples of Native American craft art, basketry, rugs, clothes. Emphasize that these crafts were decorative as well as utilitarian, made for everyday use and also for ceremonial use. Discuss the use of symmetrical designs in Native American art. Teacher demonstration of pulling strings out of burlap to create areas in which to weave. Vertical strings in a weaving are called warp strings, and the horizontal strings that actually DO the weaving are called weft strings. Demonstrate a variety of possibilities. Wrapping strings, weaving in over and under patterns that could change as colors change. For instance, weaving over 4 warps, under 4 warps, etc. The next color could be woven over 2 warps, under 2 warps, etc. 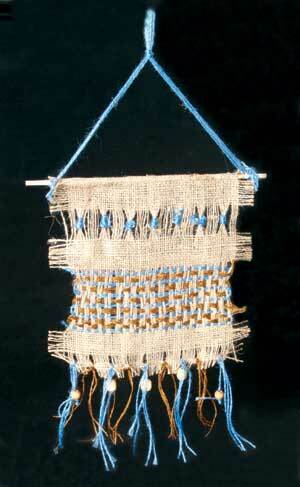 Tying strings to bottom that hang, adding beads, fraying the ends of weaving strings, yarns, or cords. Choose a colored piece of burlap, teacher will glue dowel to top, tape sides of dowel to table to make working easier. Make name tag and tape to dowel rod. Must use at least 3 techniques that were demonstrated, may also invent other techniques. Reminder that each student must use at least 3 techniques as well as inventing others.